Imagine a remote tropical Island in the far reaches of Southeast Asia where a large proportion of avid travellers collide, uniting with a fierce passion for underwater adventure? A place where it’s inhabitants eat, sleep, breath and PARTY in appreciation of an incredible day filled with adventures at the bottom of the sea floor. Well fortunately it turns out you don’t need to imagine such a place – for this scuba diving utopia really does exist. Not in your imagination… but in the pristine waters in the Gulf of Thailand – this place is the tropical island known as Koh Tao. Koh Tao, which translates to Turtle Island… is a tropical paradise where the blue ocean waters are as warm as the sunny days sailing them. Koh Tao is one of 3 popular islands in the Gulf of Thailand where backpackers and water sports enthusiasts flock to take advantage of the gorgeous beaches and warm water. 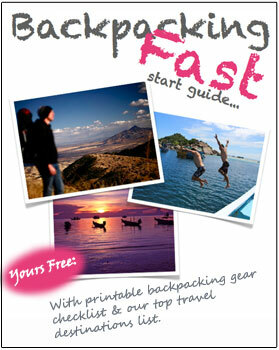 And Koh Pha Nhang – infamous for its monthly ‘Full Moon’ , ‘Half Moon’ and ‘any other excuse’ Party. By no means ‘diving fanatics’ – we probably only clock up 2 or 3 dives a year… but we were quickly consumed by the pulsating and hospitable island atmosphere of Koh Tao and all it’s diving & water sport offerings. We departed from Koh Samui & couldn’t help but notice the sense of camaraderie beginning to form among divers of all ages and experience prior to even boarding the ferry. 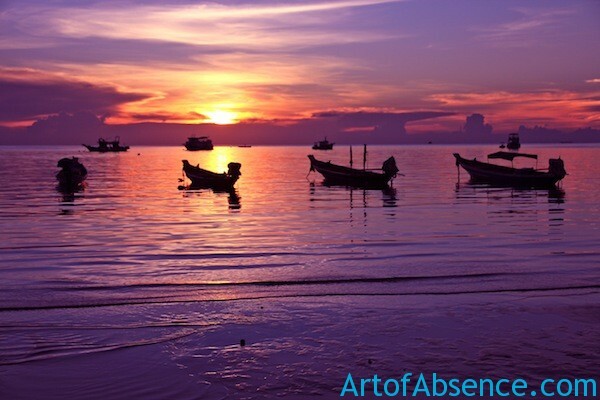 It certainly helped that the ferry departed over an hour late (not an uncommon occurrence) – we had to remind ourselves that when in Thailand you operate on ‘Thai’ time… where departure times are always a mere estimation. 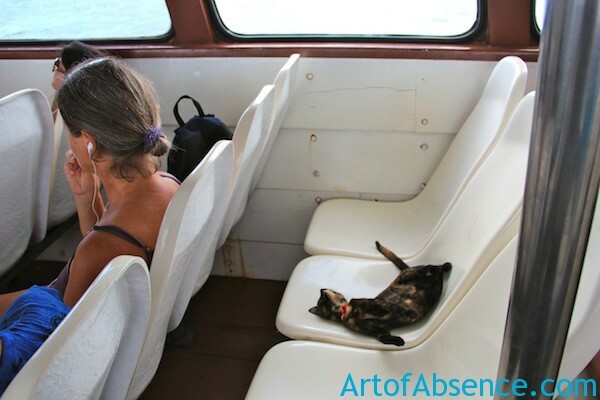 Oh and one more point to note while on the topic of transport – just because you’ve purchased a “ticket” doesn’t always guarantee you a seat on the ferry. 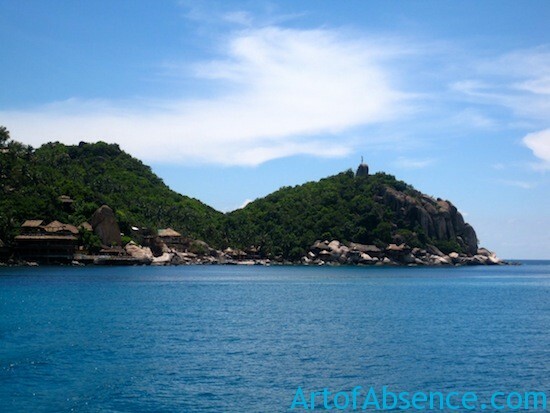 When travelling to Koh Tao within a few days of a Full Moon Party… the Ferry will be busier than usual as it first stops at Koh Pha Ngan to drop off party goers… before continuing on to Turtle Island. So try to get a bit of a hurry on when you get the all clear to board the ship. Whilst we managed to dive onto and secure a seat… we were still jammed in (including the isles). For the next 2 or so hours I had the exquisite pleasure of having to ensure my legs stayed tightly crossed, and both my legs and arms were pulled in – far away from the isle to avoid touching a well worn traveller sporting some highly dubious, raw (and very painful looking) battle scares on his arms and legs. (Ahh the joys of travelling I remind myself). Having successfully managed to steer clear of all things appearing infectious, I finally departed with cramped legs and aching arms onto a picturesque, time weathered timber jetty which would willingly lead us to our home for the next few days… our “island of all things scuba”. We were met by our hotel and quickly whisked away amid the calamity of touting dive school operators (there are more than 30 diving companies on the island) to what would be our diving hub for the next few days. Most hotels appear to offer free pickup from the jetty if you ask when you make the booking – however they don’t appear to be too quick to offer this service unless prompted. Within the hour of arriving at Asia Diver’s Resort (lovely rooms, great food and of course an impressive pool that is also used for diver training) we were deeply engrossed in discussions with diving instructors who operate from the hotel – covering all aspects of our scuba activities on Koh Tao including… potential dive sites, timetables & previous underwater experience. The PADI accredited diving school was led by Mark – a rather tall Frenchman with a just as impressive diving history and a long history of living and working in Koh Tao. Mark was extremely thorough and safety conscious. As neither of our party of 4 had dived within the last 6 months, Mark was adamant we would need to undertake a ‘refresher course’. Non-the-less, Mark assured us we would not be diving without completing a refresher, so the next morning a little begrudgingly we hoped in the pool to practice some dive skills… just prior to jumping on the boat for our midday dive. The cost of the refresher course was approx 1000 Baht. 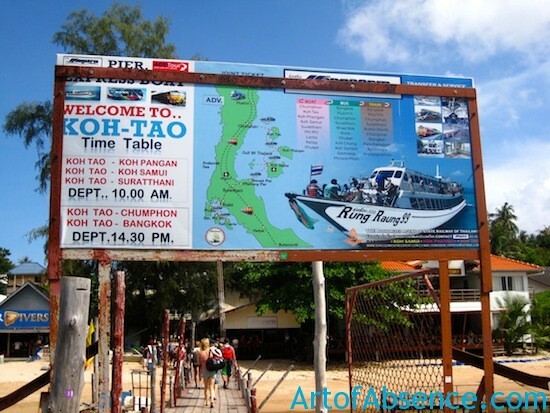 Do You Have To Be A Certified Scuba Diver To Dive At Koh Tao? One of the friends we were travelling with was not a certified open water scuba diver, so was thrilled to take advantage of the “Discover Scuba” program (a “hand holding dive” with an instructor that PADI organise to introduce new divers to scuba diving) so she could come out on the boat and take her first breaths underwater that morning with the rest of us. You can also take the Open Water course in Koh Tao to become a certified Scuba Diver. Hire Scuba Gear or Use Your Own? Whilst I felt 100% confident with the competence and experience of the dive instructors, the dive gear was best described as “well used”. Also the end of our friend’s weight belt was so frayed that he couldn’t get it back on during the skills training section of the refresher course (you have to take you weight belt off and replace it in the water) even when the instructor swam over to help! We were also short on equipment initially until an earlier dive returned with the bulk of the loan gear. Soon enough we were on our timber vessel with all our dive gear and on route to the first dive site… the Japanese Garden. The dive sites are selected daily from an extensive list of over 20 sites available according to water conditions, group requests, group experience and size. Once on the dive boat there was no shortage of Asia Diver’s staff to assist with gear preparation, and plenty of water and biscuits to keep your energy levels up. As dive sites go, the Japanese Garden was truly something special to experience. Situated to the north west of Koh Tao Island, this dive site – named after the ornate arrangement of coral species is exquisitely beautiful – ranging in depth from 2m to 15m you’ll find yourself within an absolute wonderland of colour, activity and diversity, not to be missed. The only downside can be the high concentration of other intrigued divers you sometimes find yourself surrounded by. Back on board, we had a short lunch break (all provided) and some ‘play’ time where the young – (or young at heart) could endear their inner child by leaping from the top level of the boat into the warm, sapphire blue ocean waters. Also during this time, our instructor pulled out some picture cards (yes, just like kindergarten) and reviewed the many marine species we had witnessed during our time underwater… along with the hand signals she was using to identify each particular underwater creature as they swam into view (at the time, we had no idea what was going on as she tried to communicate via funny signals underwater… and were really only relieved that she never attempted to portray a shark fin in any way). She also took time to warn us as to what we should do should we encounter an upset Trigger Fish – given they tended to inhabit our next dive site. A Trigger Fish’s territory extends in a cone from the nest toward the surface, so swimming upwards can put a diver further into the fishes’ territory; a horizontal swim away from the nest site is best when confronted by an angry triggerfish (you will see that theie dorsal spines on their back stand up) and can pose a threat to inattentive divers due to their large size and powerful teeth. The second dive site we visited is known as Twin Peak’s – or just Twins. Twins is situated on the far side of Koh Nang Yuan – being to the west of the Japanese Garden and north west of Koh Tao Island itself.Depth ranges from 5m to approx 18. There is no shortage of marine life at Twins… including moray eels, huge grouper, blue spotted rays, crabs, the ill tempered trigger fish, and the cutest little gobbie fish who are always found living harmoniously alongside a shrimp who they rely on for safety in a mutually benficial partnership – we personally saw all these and more! There is also a sanctioned area at the Twin Peak’s dive site (a circle built of small stones to keep divers out) where you might be able to say hey to Nemo as we did. All too soon, we were back on the dive boat chugging back towards the shore… returning to our resort, where after showering up… we gathered round one of the dive instructors whose turn is was to tend the bar and pump out some tunes after an incredible day on the water (or under it, more accurately). On the advice of yet another French dive instructor we headed down to Sairee beach for sunset cocktails. If I can make 2 recommendations about Koh Tao, please don’t miss the laid back beachside atmosphere of the Lotus Bar at North Sairee (look for the horizontal palm tree). Sip your drink on a cosy bean bag on the sandy beach, while watching fire shows, along with happy hour drinks and soul satisfying live music as the sun goes down. It’s the very best place to watch the sun set on an incredible day. Once your soul has been appropriately soothed… it’s time to satisfy your stomach which is always ravenous after a big days scuba diving. The Thai food here is nothing short of exceptional and at great prices. I can truly say that the only disappointing part of our trip to Koh Tao was that 3 days and 2 nights was just simply not long enough! Most people include a stop at Koh Tao in there Island travel itinerary after spending a few days on Koh Samui or attending a full moon party in Koh Pha Ngan. We stayed at the Asia Divers Resort. The rooms were comfortable and clean… but most importantly they have a pool for recouping your energy around after an early morning dive. Must Eats On Koh Tao? We highly recommend Narakaan in the evening as the sun drops down over the ocean. They have tables on the sand right next to the water.